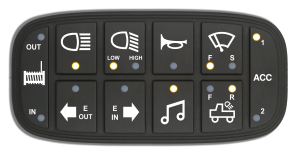 DPM's has standardized Digital Keypad designs to choose from, yet OEMs are invited to request custom laser etching or entirely new designs to personalize to their applications. 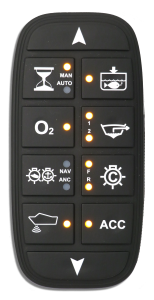 Our standard 10-key and 14-key keypads can be laser etched to be used in any orientation, horizontal, vertical, even diagonal. Each end key has up to two function LEDs that can be exposed with the laser and each inner key has three. Power Key - Activates the system and allows other keys to function. Livewell Recirculation Timer - First press turns on Manual Mode and the recirculation pump runs continuously. Second press enables Auto Mode and pump runs for three minutes, turns off for three minutes, and then repeats. Third press turns off both Manual and Auto Modes. Fuel Tank Selection - Pressing alternates between Main (default) and Aux. Horn - Activates Horn while pressed. Navigation/Anchor Light Toggle - First press turns on both functions. Second press turns off Nav lights leaving Anc lights on. Third press turns both off. When either is on, red keypad backlights illuminate the legends and function LEDs are dimmed. Dash Light - Press and hold to turn on the Dash (panel) lights and to begin dimming them. Release when preferred brightness is achieved (saved in non-volatile memory). Press again to turn off. Acc1 - Toggles Accessory output on/off. Acc3/4 - Toggles between Acc3 / Acc4 / Acc3 & Acc4 / both off. Acc2 - Toggles Accessory output on/off. Livewell Lights - Toggles on/off. Front/Rear Courtesy Lights - Toggles between Front / Rear / Front & Rear / both off. Bilge 1/2 Pumps - Toggles between 1 / 2 / 1 & 2 / both off. Livewell Airator - Toggles on/off. Livewell Fill Pump - Toggles on/off. Tilt Up - Activates outboard's tilt pump while pressed. Acc - Toggles Accessory 1 output on/off. Tilt Down - Activates outboard's tilt pump while pressed. Sonar - Toggles output on/off. 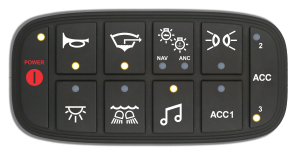 Navigation/Anchor Light Toggle - Toggles between Nav & Anc / Anc Only / both off. Livewell Recirculation Timer - Toggles between Manual Mode / Auto Mode / both off. Winch In/Out - Activates the IN or OUT output for the winch contactor while pressed. Press simultaneously with Left Blinker to switch to OUT, or Right Blinker to switch to IN. Low Beam/High Beam - Toggles between LOW and HIGH. Horn - Activates output while pressed. Windshield Wiper - Toggles between FAST / SLOW / OFF. Accessory - Toggles between ACC1 / ACC2 / ACC1 & ACC2 / both off. Light Bars - Toggles between FRONT / REAR / FRONT & REAR / both off. Right Blinker - Toggles on/off. Press simultaneously with Left Blinker to activate Emergency Flashers. Press simultaneously with Winch to switch winch direction to IN. Left Blinker - Toggles on/off. Press simultaneously with Right Blinker to activate Emergency Flashers. Press simultaneously with Winch to switch winch direction to OUT. Master Power - Activates the system and allows other keys to function. Nav/Anc Lights - Toggles between Nav & Anc / Anc Only / both off. Cockpit/Compartment Courtesy Lights - Toggles between Cockpit / Compartment / Cockpit & Compartment / both off. Starboard Livewell Fill/Aerator Pump - Toggles between MAN / AUTO / OFF. Starboard Livewell Recirculation Pump - Toggles between MAN / AUTO / OFF. Starboard Livewell Pumpout Pump - Toggles on/off. Acc 2 - Toggles on/off. Acc 3/4 - Toggles between ACC3 / ACC4 / ACC3 & ACC4 / both off. Acc 1 - Toggles on/off. Port Livewell Pumpout Pump - Toggles on/off. Port Livewell Recirculation Pump - Toggles between MAN / AUTO / OFF. Port Livewell Fill/Aerator Pump - Toggles between MAN / AUTO / OFF. Bilge Pump - Toggles on/off. Dock Lights - Toggles on/off. Acc 2/3 - Toggles between ACC2 / ACC3 / ACC2 & ACC3 / both off. Underwater Lights - Toggles on/off. Mood Lights - Toggles on/off. Courtesy Lights - Toggles between FRONT / REAR / FRONT & REAR / both off. Panel (gauge) Lights - Toggles on/off. Hatch Up - Activates up actuator while pressed. Hatch Down - Activates down actuator while pressed. Bilge Blower - Toggles on/off. Windshield Wiper - Toggles on/off. Depth Sounder - Toggles on/off.